Regrettably, the identity of Eliot Spitzer’s prostitute has gotten out, the Smoking Gun has some photos, and the e-trolls have plastered her myspace page with some amazing things. 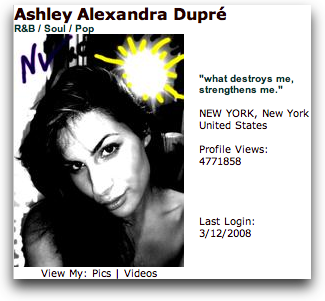 At least a million people have visited Ashley Alexandra Dupr?©’s myspace page so far according to the play count on one crappy song she put up there. This is truly a moment where we should step back and think about how much of ourselves we put online, not only that which is represented in (bad) songs, but photos, videos, etc…. What if you were Spitzer’s right hand man? What would ‘get out’? If you don’t know what this is, scan to the bottom for some news clips. I bet 9 dropped a 2 when the feds called. In his pants. 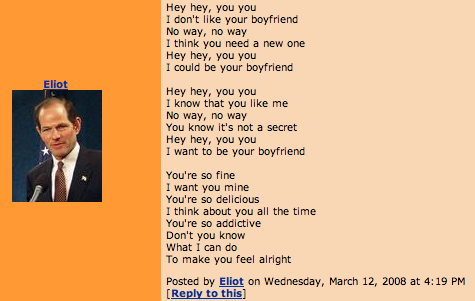 fascinating stuff… thanks for keeping a tag on this. looks like the profile has been deleted!